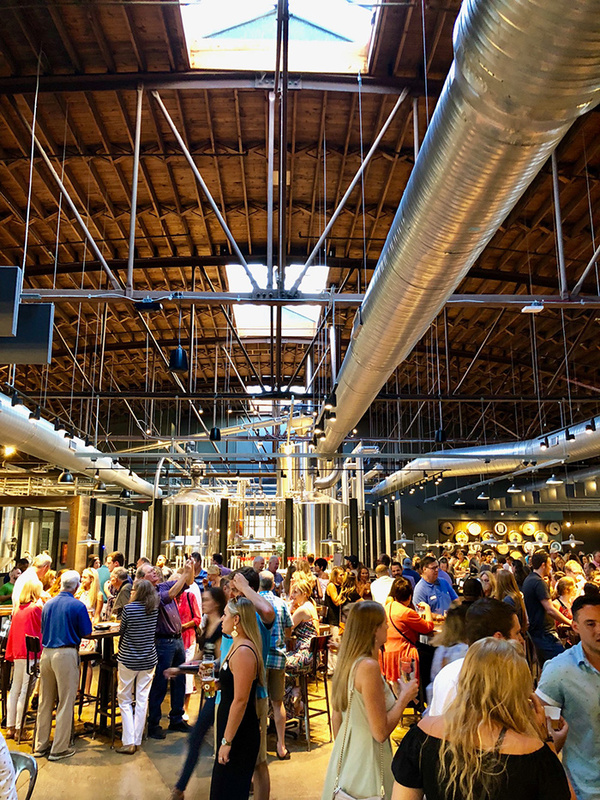 Charlotte’s brewery scene is a force to be reckoned with. Looking for where to grab your next craft beer? Here’s a quick guide to breweries in Charlotte. This new University City brewery is set to open March 15 and plans to specialize in gluten-free beers. The 3,500-square-foot taproom will have 18 taps offering up a mix of both regular beer and gluten-free beer. Fun fact: Andrew Kalinoski, former head brewer at Sycamore Brewing, is the brains behind Armored Cow. Birdsong’s 30-barrel brewhouse and taproom opened back in 2011 and has since become a go-to for unfiltered, American-style ale. The vibe: Expect a laid back neighborhood feel. They’ve got a nice patio space for warm weather days. Follow the Stewart Creek Greenway and you’ll run right into Blue Blaze. It’s got a large selection of American, English and German beer – all brewed with locally sourced ingredients. The vibe: Very chill. I love Blue Blaze for their beautiful, nature-inspired taproom and their outside rocking chairs. Fun fact: Their name is inspired by paint stripes, called blazes, that mark the Appalachian Trail. This female-owned brewery specializes in well-loved styles of beer whose clever names pay homage to “Bold Missies” that have shaped history. We’re talking Amelia Earhart and Annie Oakley. Two breweries, one roof. The joint venture between Southern Tier and Victory Brewing is LoSo’s newest staple. With a 28,000-square-foot taproom, 120 taps and an impressive food menu, what’s not to love. The vibe: Lively without feeling overwhelming. Catawba’s easy-drinking beer and patio with a skyline view makes the new 10,000-square-foot taproom a weekend must. Looking for more than just beer? Keep up with events like trivia and run club here. The vibe: Laid back with a great mix of indoor and outdoor space. And did we mention skyline views? Owner Ben Dolphens describes Divine Barrel’s beer as a “good mixture of different experiments” that take on classic styles – think a saison refermented with Brettanomyces and Polish grodsizkies with aji limon peppers. 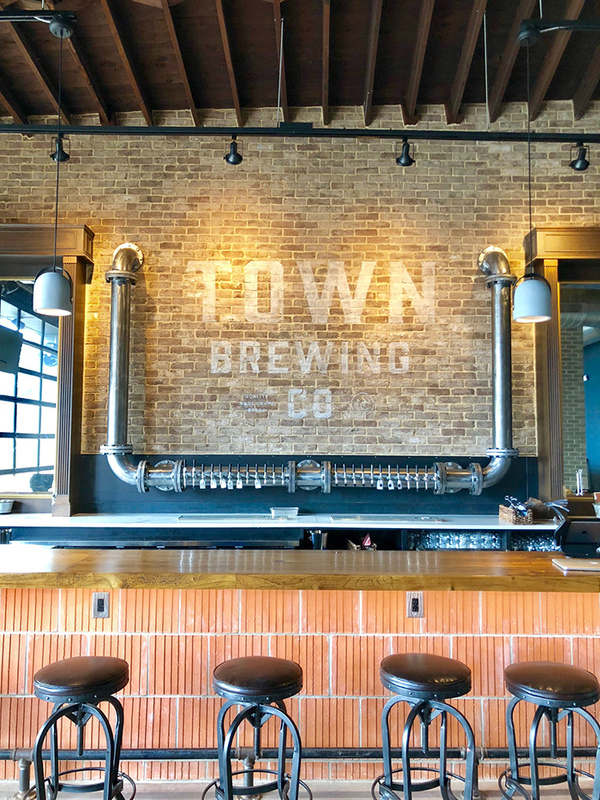 The vibe: Rustic and industrial-style taproom. Love the rugged wood paneling behind the bar. Find the cozy taproom, plus plenty of live music, an occasional market and a menu full of dynamic styles of beer, across the parking lot from Amélie’s in Villa Heights. 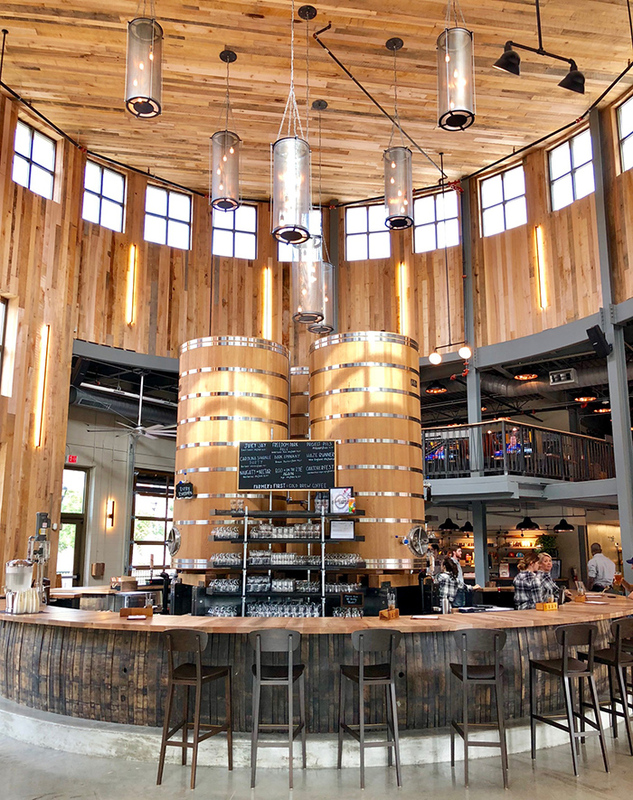 The vibe: The taproom has kind of a casual, farmhouse aesthetic and feels super inviting. Fun fact: Free Range is owned by brothers Jeff and Jason Alexander, who were raised in Eastern, NC. 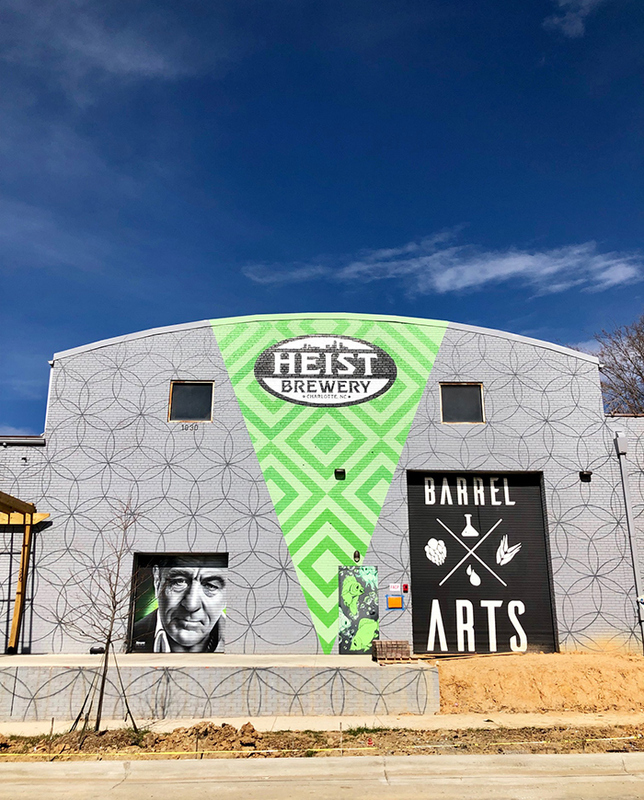 Heist has two locations, the original Heist Brewpub in NoDa and the new Heist Brewery & Barrel Arts near Camp North End. 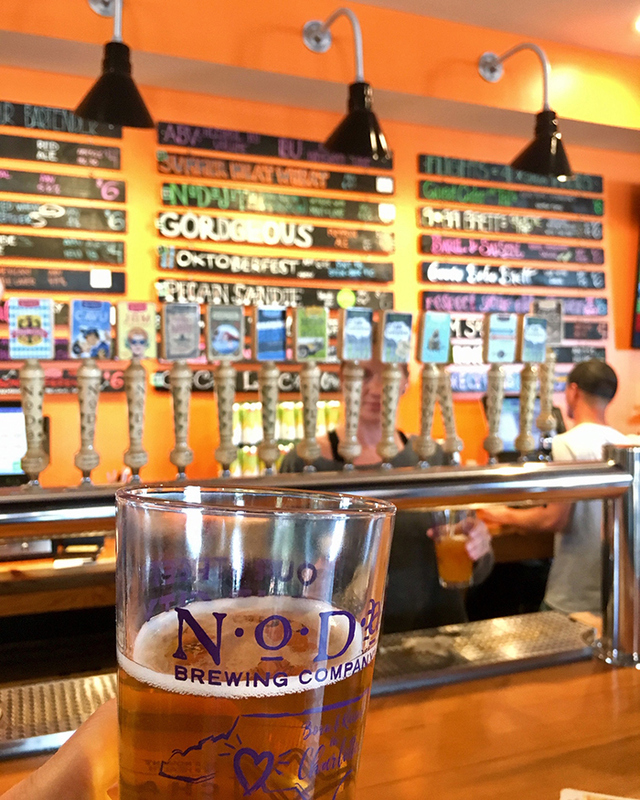 One of the city’s original breweries, NoDa-based Heist is a classic spot. Their brunch buffet (usually accompanied by a donut tower) is a hangover must. The new Heist Brewery & Barrel Arts is a 26,000 brewery and taproom will include a covered beer garden, bakeshop, two event spaces and a separate area for their barrel aging program. The brewery will feature a floor-to-ceiling Clint Eastwood mural when you walk in. Brewpub vibe: Think industrial meets old pub. Heist is no frills, just good food and beer. Legion Brewing has two locations, the original in Plaza Midwood and a new location in SouthPark. After finding its footing in Plaza Midwood, the brewery known for Juicy Jay expanded to SouthPark, making it the neighborhood’s first brewery. 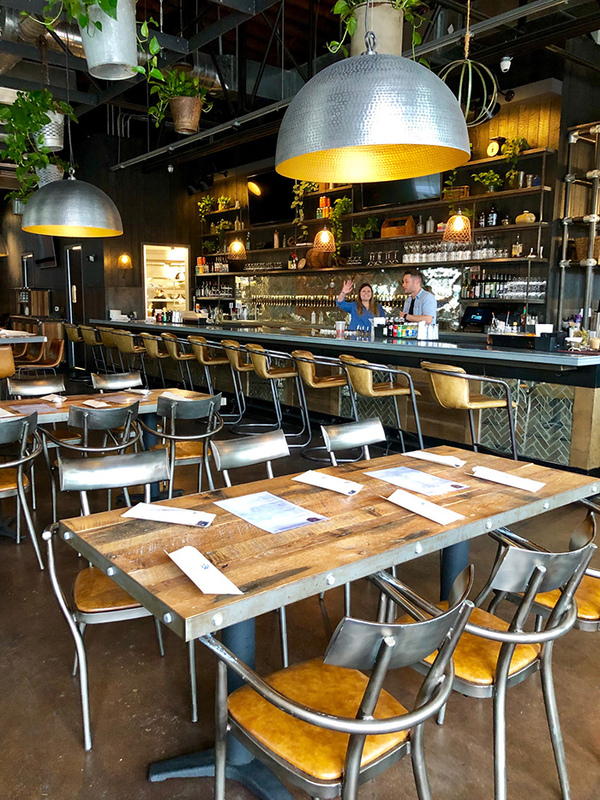 The vibe: Legion’s OG location in Plaza has a cozy, neighborhood vibe while it’s SouthPark spot is much more open and airy. A one-stop-shop for not just traditional ales and lagers, but also organic kombucha, gluten-free wild ales, sours and more in a setting good for drinkers and non-drinkers alike. The vibe: On weekends, the outdoor space feels like a backyard cookout with live music and food trucks. Currently under construction, Lower Left Brewing Co. is set to join the brewery-filled district of LoSo this year. Lower Left will have a seven-barrel custom-made brewhouse and 900-square foot taproom. The building has four garage doors, which will open to an outdoor patio. The beer: Expect 4-6 core beers available year round including a New England IPA, tropical IPA, American pale ale, blonde ale, amber ale and a porter or stout. Pineville’s first brewery, Middle James Brewing, is set to open this Spring. The two-story space can be found behind The Gold Village and will feature 24 taps, a food menu, and shaded deck overlooking the putting green. 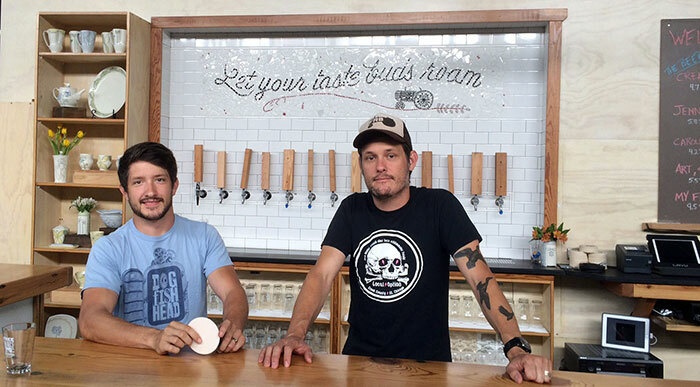 Fun fact: Along with beer, Middle James will offer wine, cider and kombucha on tap. The brewery, which does not yet have a name, plans to open later this summer in Midtown. Plans: The Midtown brewery will have a large outdoor patio fronting 4th, along with a 750 square foot “elevated patio” toward the interior of the site that’ll likely have cool Uptown views. Space: It’ll take the space formerly occupied by American Billiards Company in a cool 1920s building. The brewery, now in Optimist Park, is known for both its year-round staples like Jam Session and its seasonal batches like Gordgeous and NoDajito. It’s also a go-to for weekend activities – keep up with events here. Fun fact: In addition to beer, they also have craft spiked seltzer on tap. 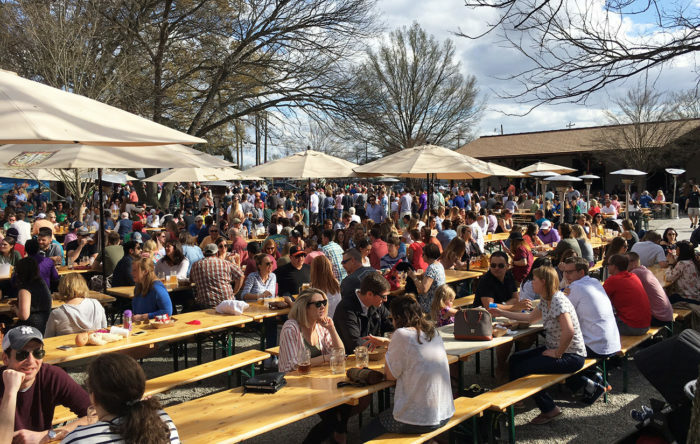 This quintessential Charlotte brewery is home to a massive Biergarten that welcomes children and dogs alike. Olde Meck is unique in that they follow the German “Reinheitsgebot,” aka the oldest beer purity law in the world, when brewing their award-winning beer. The vibe: The inside feels like a tavern-y, old German brewhaus and outside is an expansive, airy biergarten. One of the city’s newer breweries, Pilot can be found in the same complex as the new Yafo location. There’s no flagship or signature beer, as all batches are small and experimental. They call themselves a nano-brewery. The vibe: Casual and cozy. This small brewery steps from Plaza Midwood’s main drag is, like the neighborhood, unique, specializing in hop-forward IPAs and pale ales, lagers, barrel-aged beers and fermented ales. The vibe: Funky neighborhood hang out spot. Wine deal: Resident Culture recently launched a curated wine program and does half priced bottles of wine on Thursdays. Salud Beer Shop’s in-house brewery. 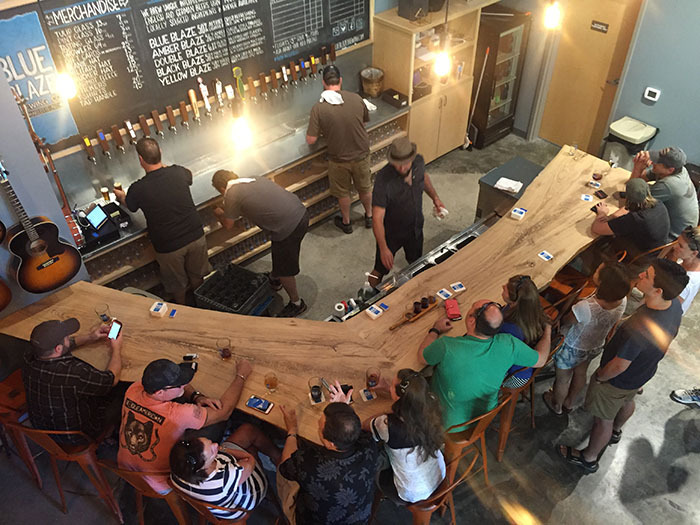 Head upstairs to enjoy a pint in their 3,100-square-foot taproom. They also have a kitchen serving up wood-fired pizza. The vibe: Eclectic and artsy. Occupying a cool mid-century model building in The Gold District, Southern Solstice Brewing has plans to open this year. It will feature a 3,200 square foot taproom and 1,800 square foot front patio. Expect no flagship beers – the taps will rotate. Suffolk Punch has become a Rail Trail destination with a gorgeous taproom and beer menu consisting of their own brews alongside some of the best in the country. Pro tip: Try out their brunch. The vibe: A little more elevated that your typical brewery. The patio is usually packed on nice days. Known for its Belgian-inspired beer, Sugar Creek uses multiple types of hops and combines them with award-winning malt varieties to create modern takes on classic tastes. The vibe: It’s a smaller space with a casual feel. Everybody’s go-to brewery, thanks to its killer location and huge outdoor space, often home to yoga, Food Truck Friday and Sunday brunch. Keep up with events here. The vibe: Friendly and energetic. Expect lots of people and lots of dogs. Thirsty Nomad’s cozy taproom is home to saisons, pale ales and chocolate stouts, plus wine and cider for your picky, non-beer drinking friends. The vibe: Small and intimate with a slightly nerdy steampunk aesthetic. The brewery, from the mind of a physician-turned-professional-brewer, is named after Dickens’ A Christmas Carol, but that’s about the only thing Christmas-related you’ll find in this coffee shop-esque taproom. The vibe: The exterior looks like something you’d find on an old London street and the inside bar gives off a similar feel. This brewery joined the scene late last year. Expect IPAs, kettle sours, porters, English and Belgian styles and a rotating selection of other crafts, plus ciders, kombuchas, housemade sodas and other non-alcoholic options. The vibe: Their 24-tap taproom feels casual like a living room with an old school warehouse aesthetic. 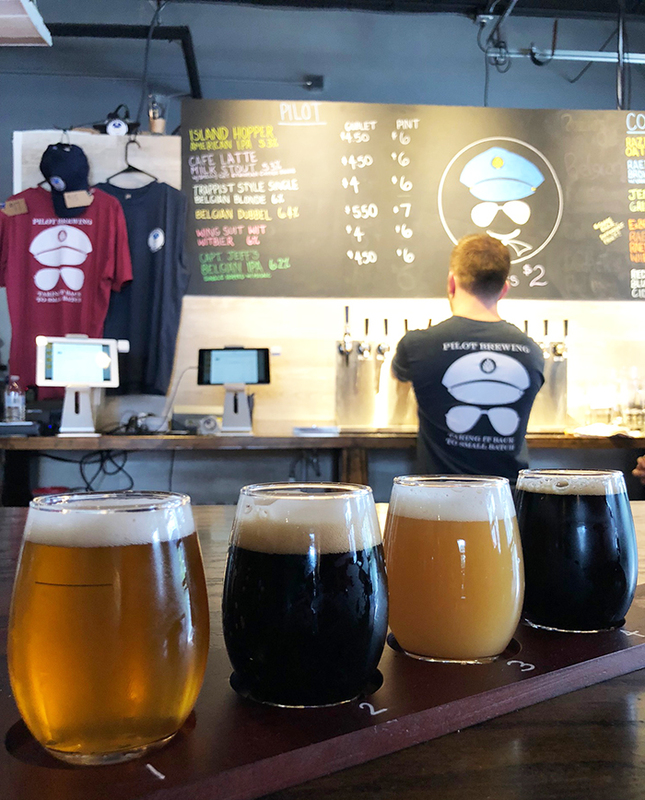 Even if you haven’t ventured into the taproom of one South End’s first breweries, Triple C is home to beers you likely know, including Baby Maker, Golden Boy and Light Rail Pale Ale. The vibe: No-frills, chill atmosphere. Listen to live music or play a board game. 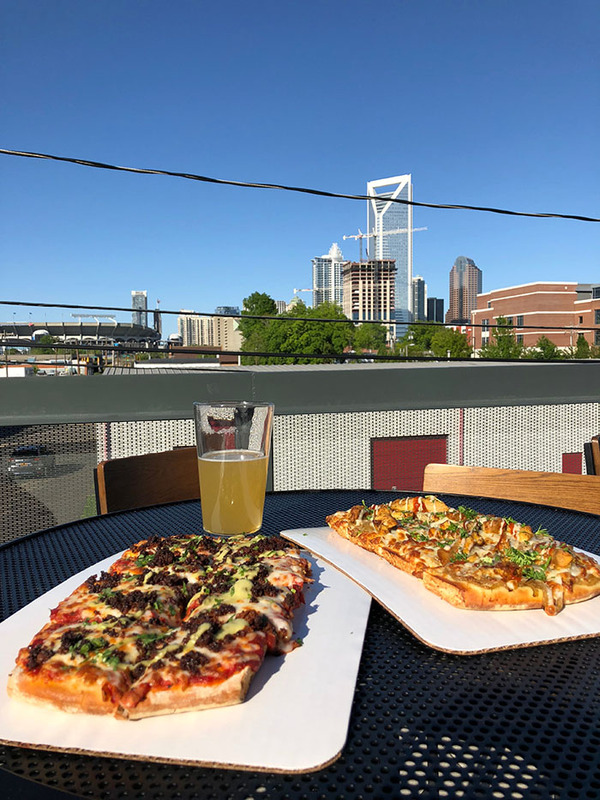 Unknown is now home to a new rooftop bar with a skyline view, a remodeled taproom and permanent pizza food truck in partnership with Seoul Food Meat Co. and a menu that complements your Feather Light perfectly. Fun fact: Every Saturday they host a Bike & Brew ride where you can go on a 10, 25 or 35 mile route and then enjoys beers at the end. 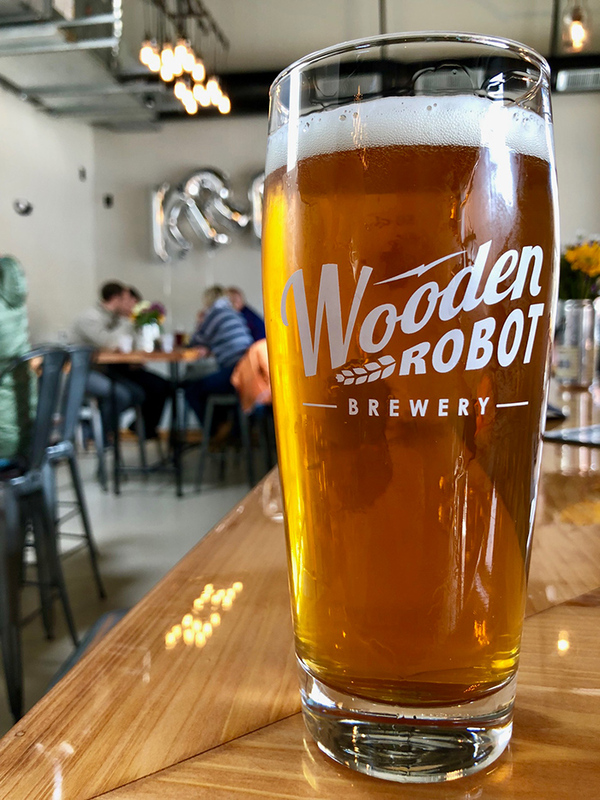 Wooden Robot will soon have two locations. The original spot is in South End and another location is under construction in NoDa. 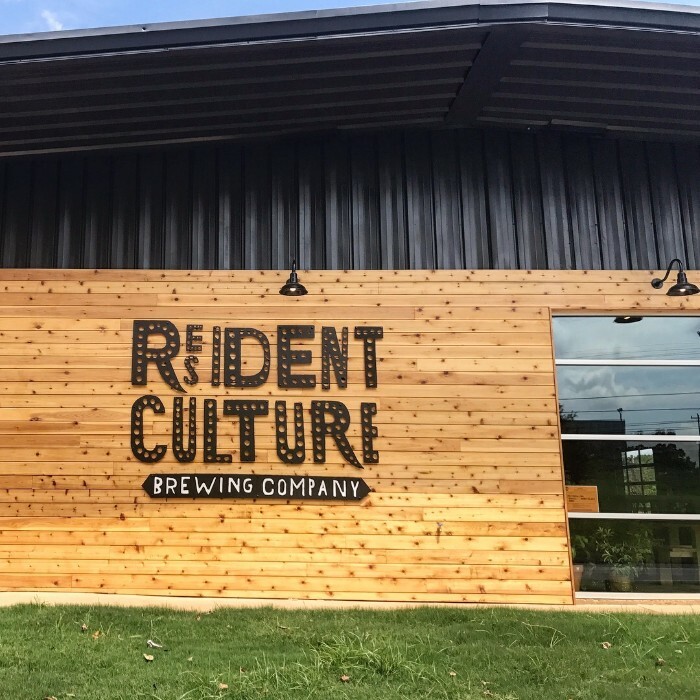 The brewery best known for its Good Morning Vietnam and What He’s Having brews is expanding in more ways than one: last year they added Kre8 Gastropub to the South End location and they are opening their new NoDa location this year. The vibe: A perfect mix of laid back and lively. Still thirsty? There are 21 breweries to visit right outside of Charlotte. 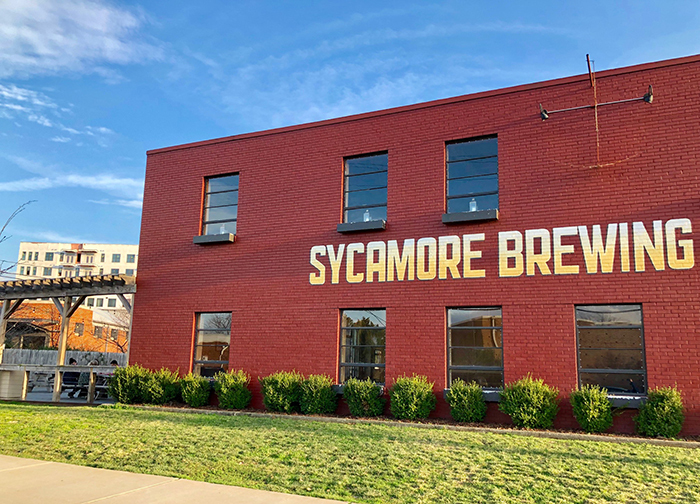 These breweries may not technically be in Queen City but are close by and worth a visit.